Meet your new favorite fall salad! Well, at least my new favorite fall salad. And let me tell you, I feel uber trendy / fancy / cool calling this a harvest sweet potato and brown rice salad. Because I am decidedly one of the least trendy people around. But it just seemed so appropriate. So it stays! Anyway, let’s move past all this trendy talk and focus on the food at hand. But before we get to the nitty gritty of the recipe, let’s address the fact that yes, that is wild rice in the pictures and not brown rice. I apparently grabbed the wrong kind when I made this to take pictures and well, pretty much just realized this now. So brown rice, wild rice. It all tastes good here. I speak from experience. Use whatever you have on hand! Also, if you feel so inclined, I’d advise serving with a big bowl of crunchy pita chips. The best! We’ll start with some roasted sweet potatoes … with just the tiniest touch of cinnamon and nutmeg. Adds the perfect hint of warmth. Next, we’ll whisk together a simple dressing with pure maple syrup, apple cider vinegar and a clove of garlic. So fall-ish! Finally, we’ll toss it all together with some cooled brown (ahem, or wild) rice, some sweet sliced apple, crunchy pecans, dried figs and of course, some greens. Combining into the perfect filling, colorful, cozy salad! I mean, just so pretty. Almost too pretty to eat. Ha – who are we kidding, that will never stop me. Recipe for harvest sweet potato and brown rice salad. 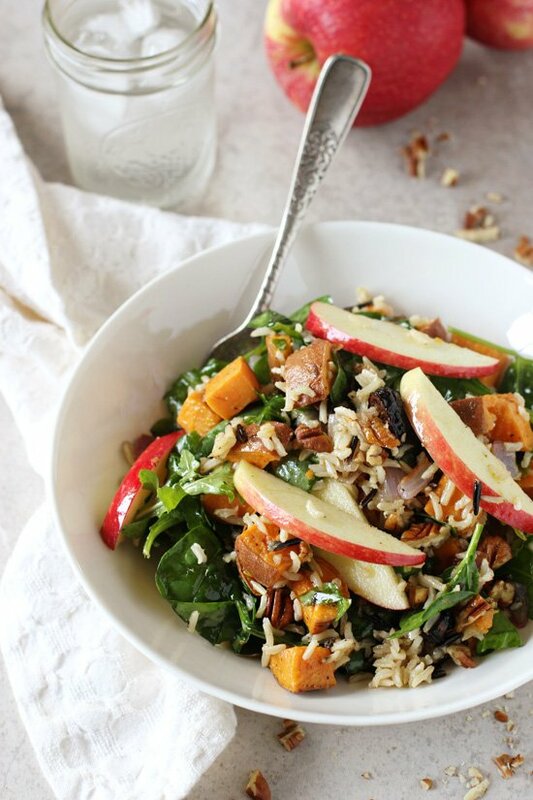 With roasted sweet potatoes, brown rice, sliced apple, crunchy pecans & a simple maple dressing! Add the red onion and sweet potatoes to a large rimmed baking sheet. Drizzle with the olive oil and sprinkle with the salt, pepper, cinnamon and nutmeg. Toss to combine and spread in an even layer. Bake for about 25 minutes, stirring once halfway through, until the potatoes are tender. Set aside to cool for about 10 minutes. Add all the ingredients for the dressing to a small bowl. Whisk vigorously until well combined. Add the cooled potatoes, cooled brown rice, the apple (or pear), pecans, figs and the arugula/spinach mix to a large bowl. Toss gently to combine. Drizzle in the desired amount of dressing (I use all) and toss again to coat. Serve immediately. When possible, I like to make the rice ahead of time for this salad. You really want it to be at room temp (or even chilled) before using. When I can’t make it in advance, I use quick cooking brown rice (so that it doesn’t add any extra time to the recipe). The potatoes, dressing and rice can all be made ahead for this dish. Store in separate containers in the fridge and then all you need to do is assemble when ready to eat! Pssst. Looking for more delicious dinner ideas? Be sure to check out the stir-fry I created for Oh My Veggies! I was just wondering what to do with the last of the wild rice in an open package, now I know! Pretty sure I can get my husband on board with this salad, too! This salad looks amazing, Ashley! 🙂 What a great fall combo! Ooooh I LOVE this. So many incredible textures and flavors with the rice and veg and dried fruit and nuts. The list goes on and on! Also love that you use ACV in the dressing. Always great to get more fermented foods in whenever I can! This salad is indeed so pretty — almost too pretty to eat. Love all the flavors, colors and awesomeness going on here. Perfect for Autumn. Trendy or not, this looks like one amazingly delicious salad, and it’s absolutely perfect for fall. I want this for lunch! This looks just lovely!! And I love the sounds of that mapley dressing!! I love both wild and brown rice. A great salad to celebrate the harvest, Ashley. I think Harvest is the perfect name for this, trendy or not! The whole combo sounds amazing. I feel like it should be on the menu at Panera, haha! This salad would be a goner in my house! I’ve reached the point where I’m a little concerned I’ll take on an orange hue from my sweet potato consumption. This is a great new-to-me way to enjoy them! Ha! I think the same thing! We eat sooo many! Thanks Alyssa!! My one son LOVES sweet potatoes and rice to the exclusion of basically all other starches, so he would be all over this trendy dish 🙂 Another great combo! I’m with you – wild rice is soooo good! Thanks Meg!! This is the kind of salad I want to cozy up with this fall. So many delicious flavors! I think you *must* be trendy! : ) Or more importantly, you are very timely and good at eating seasonally. The fall flavors and the textures sound great all mixed up here. Wild rice, brown rice, both sound fabulous! Totally right?? haha Thanks Monica! I love the fancy name, too!! This is the most perfect salad ever! 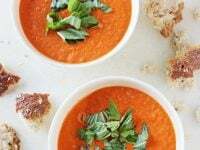 Great recipe, you are giving me such dinner inspiration for tonight! Pinned! This uber trendy / fancy salad is such a lovely smorgasbord of flavors and textures – but, how do you manage to not eat ALL the roasted cinnamon/nutmeg sweet potatoes? I don’t think I’d have the patience to wait on them to cool! haha it is hard!! Thanks Shashi! I love brown rice, but I never would have paired it with sweet potato. This really looks delicious. And you’re right, pita chips would go very nicely with this. What a beautiful start to Monday morning! While I’m a fan of both brown and wild rice, I think the wild rice here wins — it’s so pretty! You’re right! Harvest IS the new trendy fall word. I may or may not sneak that into one of my recipe titles 😉 Salad looks DELISH, and tbh i personally love wild rice more than brown! I think I do too! haha maybe that’s why I accidentally grabbed it instead! A perfect salad for a fall day! Love the idea of using wild rice too! This is such a pretty salad Ashley! I love all of the colours – so perfect for Autumn! All of the ingredients sound amazing! And the dressing sounds delicious. I love the combo of pecans, apples and figs. Yum! This looks like such a satisfying meal! Yum! Ha! I am SO the least trendy person too, so I feel ya girlfriend! BUT, I LOVE the “harvest” in this title- tres appropriate! This salad is so gorgeous, Ashley! I love that you accidentally used wild rice, because SO DELISH! This is perfect for lunch or dinner today! Pinned! Cheers, lovely! I’m glad I’m not alone 🙂 Thanks lady! haha I just happen to love me some maple syrup!! Trendy or not, I’d eat the crap out of this salad every.single.day! It’s so fresh and nutritious and those pecans are perfection. Hope you had a great weekend! haha oh gosh, I say that too much as well! And can I tell you how jealous I am? Both an apple and pear tree?? That’s awesome! I soooo need a salad after all the indulging I did this past weekend, and I’m thinking that this beauty will fit the bill. 😉 LOVE all the fall goodness you loaded into it! Mmm this salad sounds just perfect, Ashley! Thus definitely incorporates all of those delicious fall flavors. And I love the addition of brown rice!